Today I want to share with you a little update with our mudroom. 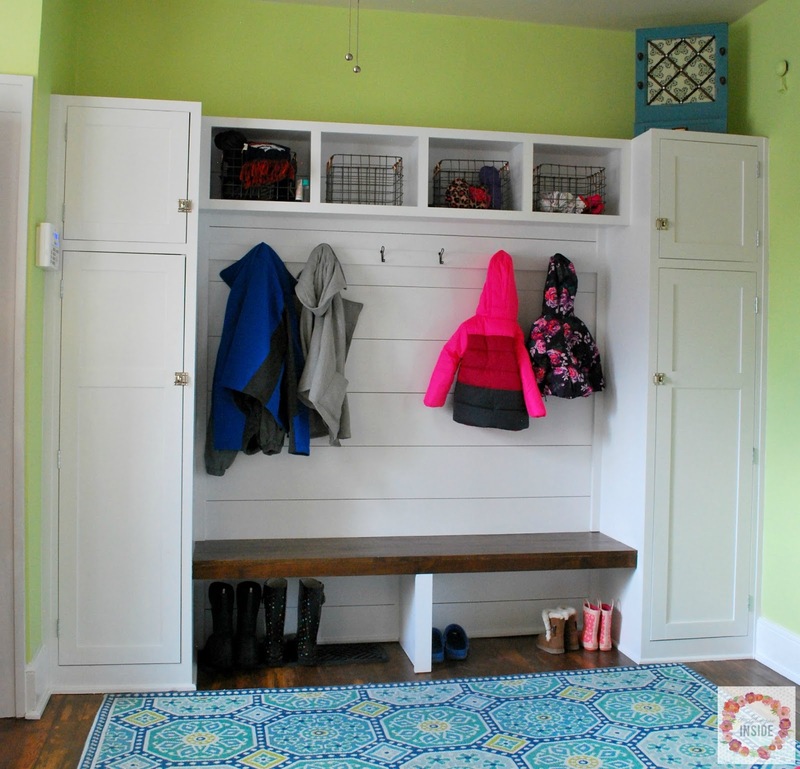 You may recall that back in December of 2015 I shared our mudroom with all of you. 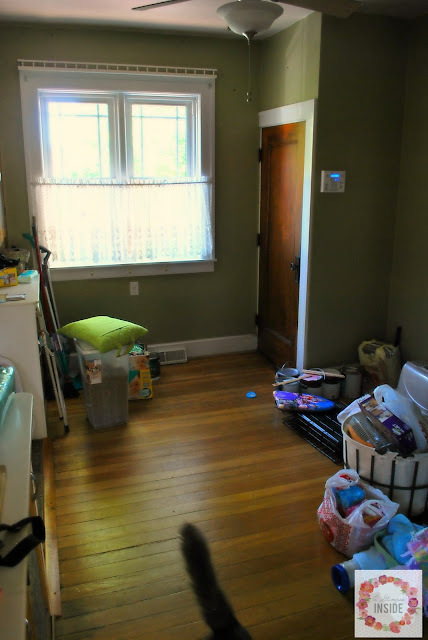 Here is a quick look at what the room looked like when we bought the house. And here is a quick glance at what we did to the room. It has been amazingly useful, especially in the winters with all of our coats and shoes, though it is messy most of the time and drives me bonkers, I am so happy we got this done when we did. Well, this was only one side of the mudroom. 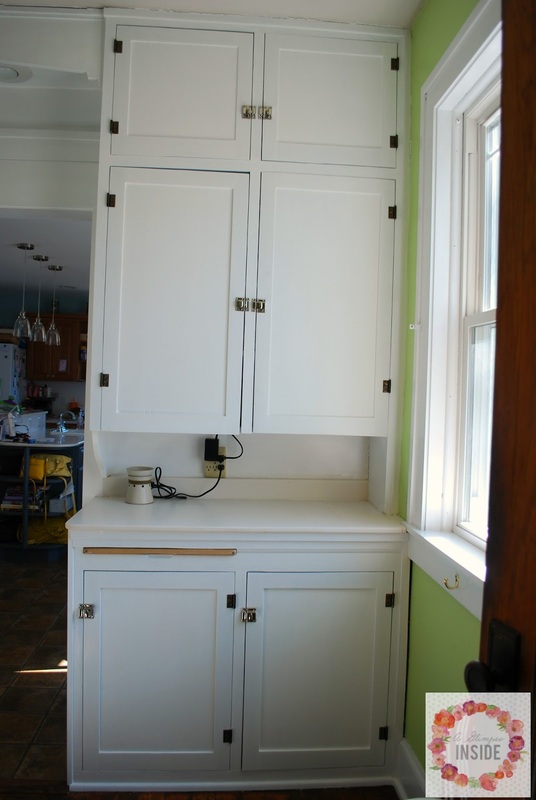 The original kitchen cabinets were still in the room but at the time when we built all this, we only did one thing on the other side of the room and it sat like that for over a year. This is what that side of the room looked like when we moved in, actually the day we closed. There was a sink and window in the old kitchen where there is now the pass through to our current kitchen. 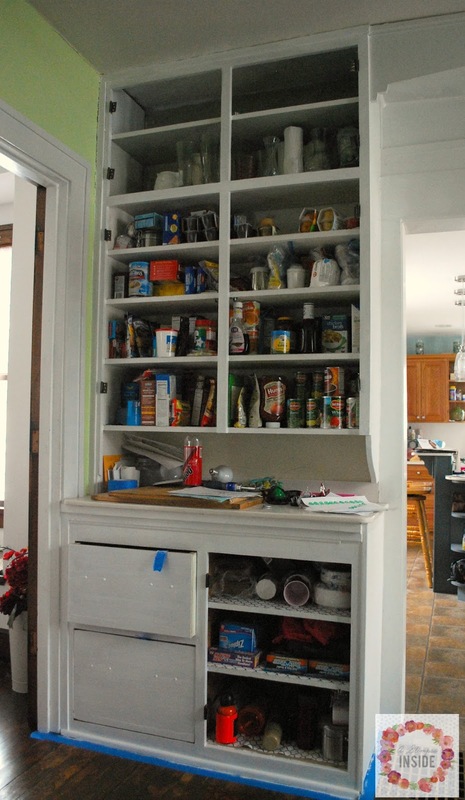 The previous homeowners added the new kitchen many years ago and at some point, not sure if it was when they were still using this as a kitchen, the previous owners cut out tin, the lady punched a pattern onto it, then they glued the tin to the fronts of the cabinets. Great for her style, not for mine so much! 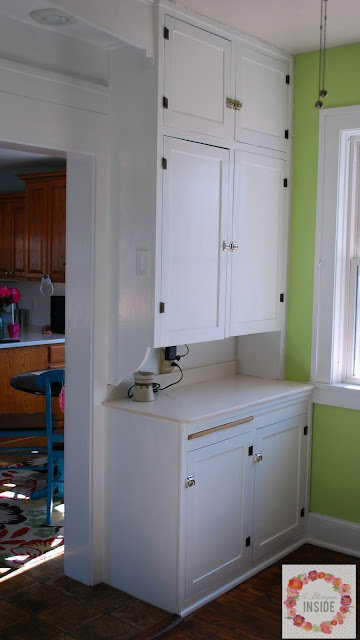 So when we added the whole mudroom area, we ripped the tin off the front of the cabinets and had to scrap away glue left behind. 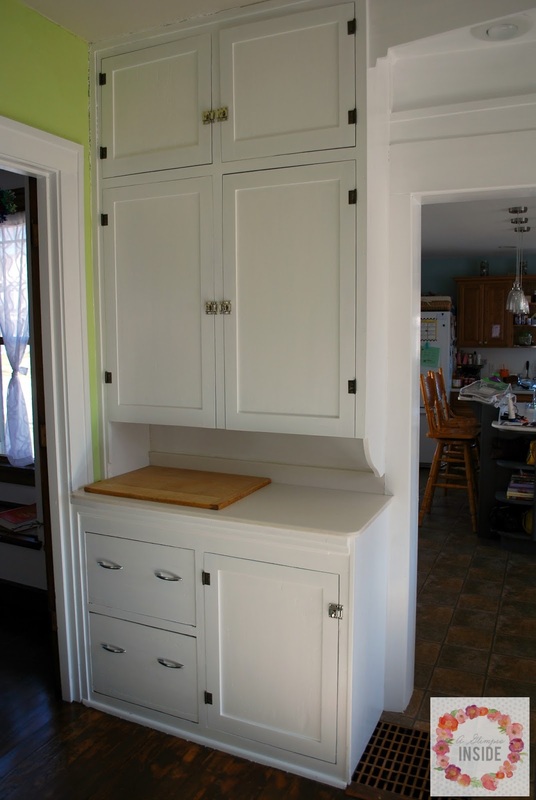 And then the cabinets sat, for over a year, with different colors, glue covered cabinet doors. We finally got around to working on them in January and the room is finally complete. It is so much brighter and I am sooooo thrilled that it is now complete! 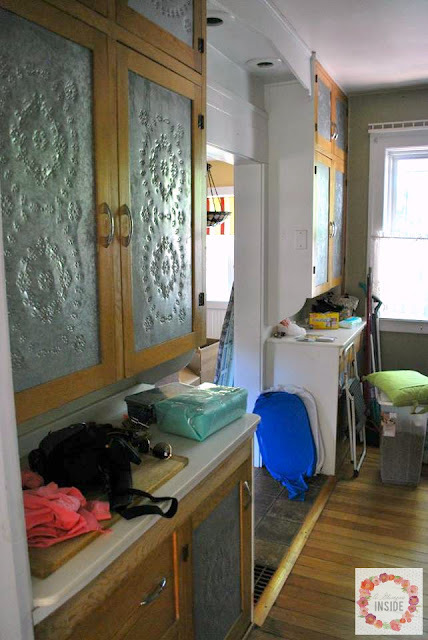 We use this side of the mudroom as our pantry, the cabinets closest to you in the picture, and the far side of cabinets I use for storing serving pieces, candles, we hide our wireless modem in there, and on the bottom we have pet food. We took the doors off and took them to our work shop in our basement and gave them a good sanding. 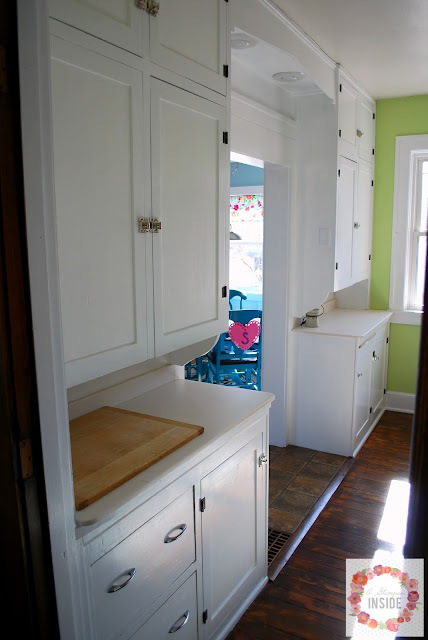 I then primed and painted the doors downstairs while working on priming and painting the cabinet bodies in the mudroom. Once everything was complete we put the doors back on and added new knobs that were very similar to the original knobs on the cabinets. 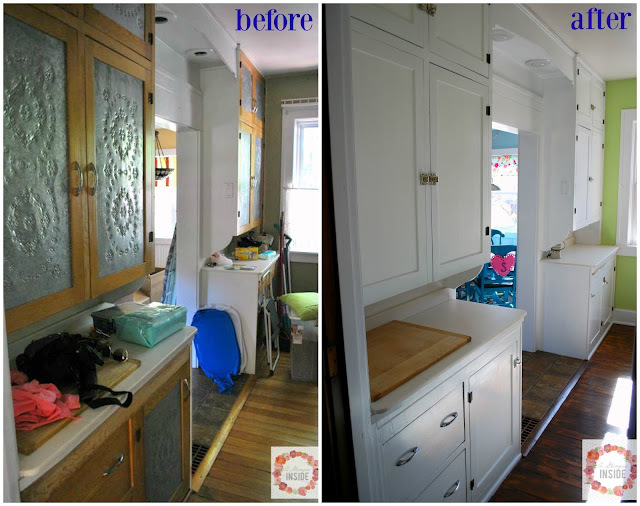 The room is now so much brighter with both sets of cabinets painted bright white like the mudroom cabinets. I originally wanted to add a bead board insert to the doors but that was before we realized that the tin was glued on and we couldn't easily pop out the center panel so we left them plain and I am happy with it. At some point, a previous owner took off the original hardware and replaced them with simple curved pulls. You were still able to view exactly where the old hardware sat and we knew it was originally something just like this, just probably in a different finish. 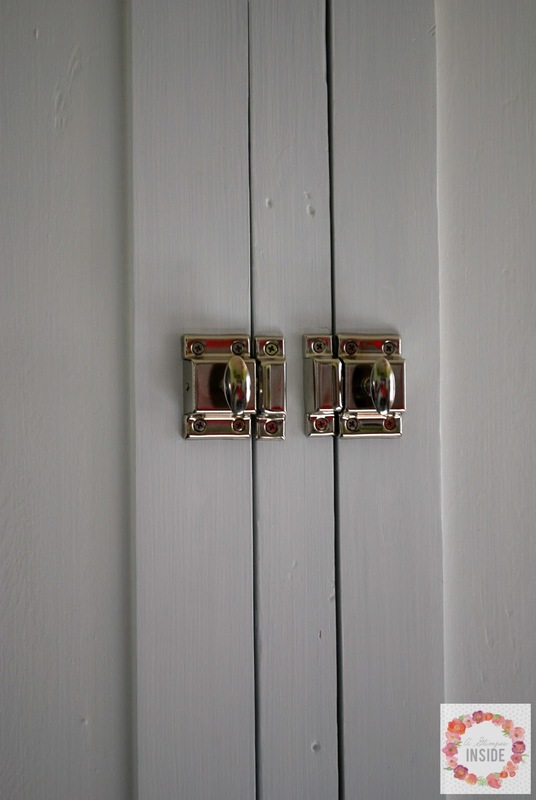 I love this look so when we ordered the knobs from D. Lawless Hardware for the mudroom area, I ordered enough for this side of the kitchen as well. I told Travis to install them directly where we could see where the originals sat and they are perfect! I took off the lace valances that were on the window while I was painting all the trim in the room and was going to replace it but after noticing how much brighter it was in the room without it, we opted to leave the window wide open to bring in all the light we can into the space. I love that this space is complete. Always pleasant to knock something off the to-do list!